Green waste is defined as biodegradable waste that usually consists of garden, yard, or park waste. It’s usually made up of garden pruning, grass clippings, leaves, small branches, flowers, and weeds. If you have a lush garden filled with abundant flora at home, it could become a source of green waste. 1. Learn to compost at home. This is probably one of the easiest ways to lessen the amount of green waste at your home. It lessens the amount of trash going into to bins and landfills. Compost is a collection of organic material such as green waste that is piled together to decompose. Composts are incredibly rich in nutrients, which do nothing but wonders for the soil. Placing a compost bin strategically near your plants ensures healthier and more stable growth. 2. Believe in grass cycling. Grass cycling is a process that follows the “reuse” concept in the three R’s. When you are using your mower on your lawn, you can leave the grass clippings behind. This can be done as opposed to collecting them and throwing them into a landfill. These clippings actually decompose quite quickly. With this, it helps return valuable nutrients to the soil, making it healthier and more fitting for plant growth. Grass cycling has the added benefit of providing nitrogen to your garden, which offers many advantages. This also helps lessen the amount of water and fertiliser your lawn requires. This saves water consumption as well as money, since you don’t need to buy fertiliser any more. 3. Reduce the size of your lawn. You can add low-maintenance plant beds, slow-growth bushes, decks, fences, and patios to minimise the lawn area. By managing your garden properly with good fertilisation and irrigation, you lessen green waste made at your home. Overall, this helps reduce water and limit weed growth in your garden. 4. Make mulch with shredded leaves and glass clippings. Using these as mulch actually has many benefits to your lawn. This helps control weeds and conserve moisture in the soil. It also helps reduce soil erosion since it keeps your garden healthy and well-provided with nutrients. You can also invest in a mulching lawn mower. This chops up grass clippings, leaves, and twigs into smaller pieces. Not only does it encourage faster decomposition, it also reduces green waste at your home! You can leave the mulch on your garden or spread it around, especially near plants you are growing. This adds nutrients and nitrogen into the soil and helps cut weed growth. Moisture is also retained more efficiently, contributing to soil health. 5. Find your plants and trees new homes. It is possible you have a certain plant or tree that has outstayed its welcome in your yard. It could even be a source of nuisance to you already. You may be thinking of having it simply removed. You can, however, take the initiative to look for someone who may want to take this particular plant or tree into their care. 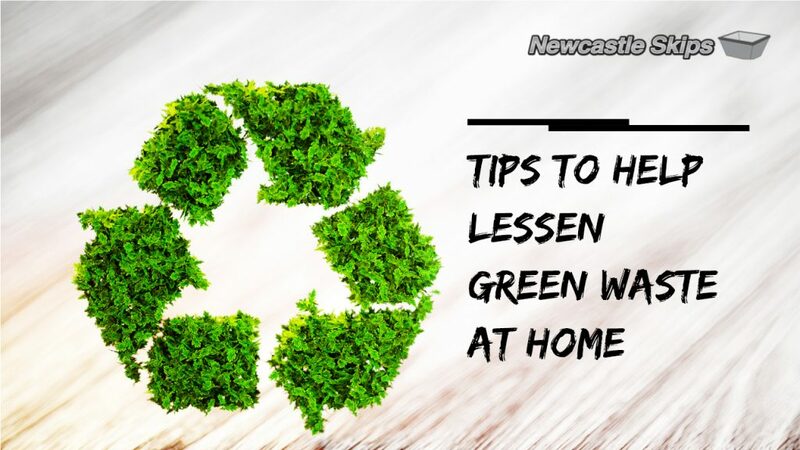 If you are looking for a sturdy container to place all your green waste, then Newcastle Skip Bins is the one for you! We have skip bins for hire in Newcastle, and our team is here to help you manage your waste removal system right at home. Cheap skip bins and green waste bins are available for your easy and practical use. What are you waiting for? Book your skip bin hire easily online!